Janice Kapp Perry Songbook SALE! We are working to put our entire print catalog online for download, but prior to that we're trying to sell off our songbook inventory. This is the perfect time to buy books for your primary kids, your youth group, or church choir. These ridiculous discounts are based on bulk purchases, with prices ranging from $2.49 clear down to 99¢ -- those are savings from 80% to 92% off of retail! ACT QUICKLY BECAUSE WE INTEND TO SELL OUT WHATEVER WE HAVE IN INVENTORY. NO PROMO CODE NECESSARY WHEN ORDERING ON OUR WEBSITE. Go to our website and click on any title to see the discounts available for that specific title. Discounts may vary slightly from title to title depending on quantities available. Because of the costs of printing and storing songbooks, once these are sold out they will ONLY be available in digital format in the future. works out to about 6¢ per song. of six individual children's books. of six individual YW's songbooks. 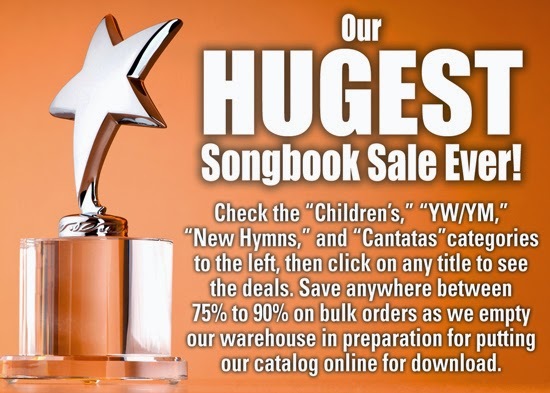 IN A FEW CASES WE ARE SELLING BUNDLES OF 10 SONGBOOKS + 10 CDs FOR $49.90 -- THAT'S JUST $2.49 PER UNIT! WE HAVE LIMITED QUANTITIES OF THESE CD TITLES SO THEY WILL GO QUICKLY. CLICK HERE TO SEE ONE SAMPLE. Discounts for online purchases only. All sales are final. Tax, shipping and handling added upon checkout. For foreign orders the product will be packed and weighed and then charged at regular shipping rates." If you don't know who Janice Kapp Perry is, she is the author of SEVERAL songs in The Children's Songbook. Some of her songs are A Child's Prayer, I Love to See the Temple, I'm Trying To Be Like Jesus, the list goes on!! She also has lots of other music that's not published in the songbook. You can go to her website www.janicekappperry.com for more information. Now is a great time to buy any of her arrangements you've been wanting to try in Primary! Leave a comment if you end up finding some great deals and what you intend to do with them in primary!! I'm pretty sure this isn't included in the current promotion, but in January, I purchased her Beloved Double Melodies CD (find it HERE) which contains the song The Church of Jesus Christ. Her website was still running a Christmas promotion so I jumped on the deal. Included with the CD is a PDF songbook. I plan on trying this arrangement with our primary when we learn this song this year! (More to come when I look into it more! ).